Baaba Maal, a world-renowned Senegal musician, speaks to "African Voices"
This week on African Voices, we profile Baaba Maal, a very modern "griot" -- a world-renowned musician whose unique mix of the old and the new is bringing a fresh audience to African music. 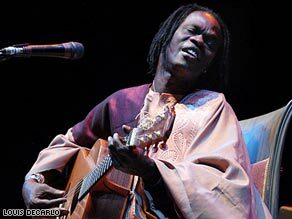 Born in 1953 in Senegal into a family of fishermen, the idea of becoming a musician and storyteller -- or "griot" -- must have felt like a far-off dream to Baaba Maal. The griot is one of the most iconic figures in Western Africa: a mixture of poet, singer, historian, journalist, and advisor. It's a hereditary position, passed down from generation to generation, and is central to both the community in which Baaba Maal grew up, and to Senegal. "I am not from the griot family," Maal told CNN. "I was not supposed to sing, even if I had a very nice voice." But through talent and hard work, Maal has succeeded in being accepted by the griot caste as one of their own and in doing so, has taken the music of his area -- and his people -- to the world. "I did struggle, and I got my place into the music," Maal continued. And that's inspired a new African generation to reach for something previously considered unattainable outside the griot caste. "They say they are going to do the same," Maal told CNN. African Voices highlights Africa's most engaging personalities, exploring the lives and passions of people who rarely open themselves up to the camera. Central to Maal's music is his wide spectrum of influences and a curiosity about other genres that continues to shape his work today. His birthplace, Podor, was for a long time a crossroads for Arab and African cultures. This hybrid of influences has consistently colored his work across the decades. Maal studied Western music in Paris and told CNN that James Brown, Wilson Pickett and Otis Redding have all inspired him. "Listening to this kind of music, I was saying to myself, 'Wow, this is so similar to the traditional African music, it's just played on different instruments.' The language is different, but the feeling, the melody, the sound of the voices ... there is a connection." That fearless and all-encompassing approach has led Maal to create his own distinct style of music, a tantalizing mix of West African sounds with a global twist. And this heady concoction of Africa-meets-West has encouraged musicians around the world to embrace his work. Maal came to prominence in the West when he worked with composer Hans Zimmer on the soundtrack for "Black Hawk Down." He counts Brian Eno and Carlos Santana amongst his collaborators. More recently, he's worked with Blur's Damon Albarn on the Africa Express project, which brought African musicians to Britain and Western musicians to Mali and the Congo. Throughout two decades of writing, recording and performing, Baaba Maal's social message has been woven into his lyrics. And it amounts to a call to arms for Africa. His songs are joyous, exuberant -- but their subject matter is often far from light-hearted. Awareness of HIV/AIDS, the importance of education, broadsides against corruption -- all form part of his repertoire. And he sings in his native Wolof despite being fluent in French and English so that he can reach a local audience. It's interesting that he often mentions Bob Marley's message of peaceful change and social awareness a template for his outlook. He recently picked Marley's "One Love" as one of his eight favorite records. Away from stage and studio, he is a leading light in the "Vision for Africa 2050" project, which envisions a prosperous, healthy and democratic continent. He is passionate about education as a way to bring stability to Africa. And as a griot, he feels a responsibility to educate as well as entertain. Perhaps it's no accident that Baaba Maal's homeland, Senegal, is one of the more stable countries on the continent, with two peaceful and largely free elections in the past decade. His new multi-lingual album, "Television," released worldwide on 1 June, once again sees Maal fuse traditional West African music and instruments with electronic dance influences to create his own eclectic, fresh yet timeless mix. CNN's Kirsty Hinton and Tim Lister contributed to this report.